Next week (lots of advance stuff this week, as I’m travelling next) sees the release of issue #1 of (Transformers) Beast Wars The Ascending. If you’ve read The Gathering (and if not, why not? ), then the cast of Razorbeast, Magmatron, Grimlock, Ravage and so on will be familiar to you, and need no introduction. But just in case you haven’t, here’s what’s what (so far). Predacon general Magmatron travels back to Earth’s past (circa 10,000 B.C.) to snag himself an army in the shape of the discarded protoforms left strewn around the prehistoric past in stasis pods by Optimus Primal and the crew of the Axalon (in the Beast Wars TV series). With me so far? Good. His intention is to reformat the occupants of said stasis pods as Predacons and return to the future to take Cybertron by force. But among his chronally displaced crew is Razorbeast, a Maximal deep cover agent, who throws an epic spanner in the works by diluting the reactivation signal. The net result is an almost equal mix of Maximals and Predacons, who then begin their own series of timelost Beast Wars. Ultimately, Razorbeast triumphs and condemns Magmatron to a temporal limbo (by sabotaging his in-progress Transwarp jump… stay with me here). The Predacons, now under the loose command of former Decepticon Ravage, are put to flight. So that’s where we are. What happens next (in The Ascending)? Well, for a start, Ravage has not abandoned his fervent wish to return to Cybertron (and the future), and to do so he has to interface directly with the other in-progress Beast Wars (Optimus Primal, Megatron et al from the TV show). Cue a major assault on the Maximal base, his ultimate goal the appropriation of the chronal phase armbands (from the The Gathering). Meanwhile, Magmatron (in temporal limbo) has seen the future of Cybertron, and, well, there isn’t one. Unable to directly affect the coming Armageddon and the rise of an ancient evil, he turns to his once and former enemy Razorbeast! And that… is all I’m going to tell you here. Beast Wars The Ascending #1 is on stores next week (Oct 3 in the US, the 4th in the UK). Click on the thumbnail below for a preview of issue #1’s cover and keep an eye on the IDW website for news of all upcoming Transformers releases. This entry was posted on Thursday, September 27th, 2007 at 9:38 pm and is filed under Uncategorized. You can follow any responses to this entry through the RSS 2.0 feed. You can leave a response, or trackback from your own site. Will the Predacon japanese exclusive Blodfang (repaint of Wolfang) appear in the profile books!?! 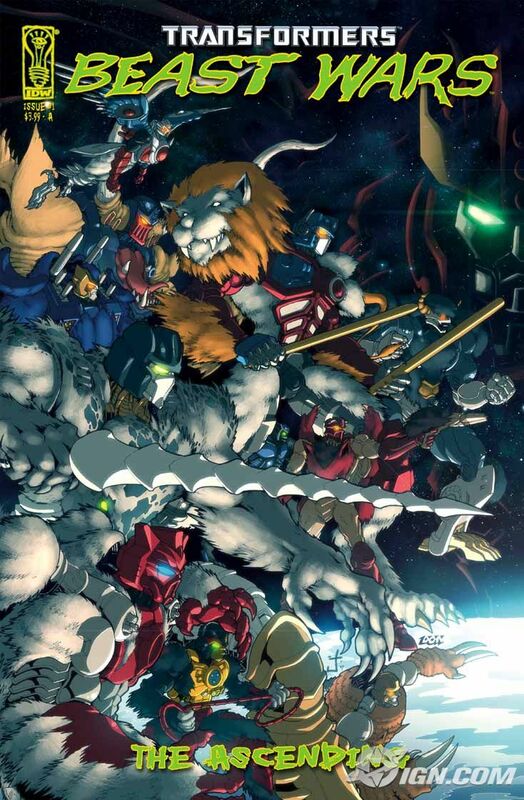 I get goosebumps reading about the pending Beast Wars stories. I’ve only recently found the tv show (I’m in the middle of the 3rd season right now) and have acquired lots of the toys in the past year. I’ll look for this when it hits the states this week. Awesome! Many thanks for keeping this sci-fi going! Just read volume #1 for myself. I must say, it’s great to see some of these loose ends tying themselves together, but I have only one issue with this all… some have suggested that you may use this as an opportunity to negate Beast Machines from the canon and go off into it’s own continuity. I love this series and would greatly appreciate it if the miniseries would fit itself into the established Beast era Canon, as there are still so many elements the shows only left us to wonder about. Re: Bloodfang. Actually, no, he’s not in there. Is this one we’ve missed? Ben? Anyone? Re: TV show. Hey, if you’re only halfway through season 3, the best (ahem!) is yet to come. Tries to squeeze ego back into box. Re: Beast Machines. It’s certainly not my intention to negate Beast Machines. We just may never get/go there. Or we might. Re: Bloodfang (again). Turns out this exclusive came out after we wrote the guts of the book. So, at time of writing, it didn’t exist. Damn those exclusives! It’s Bolfang rather than Bloodfang anyway, if you translate the name, though I can see why it could be westernised to Bloodfang. I was thinking the same when reading the comic. Great stuff yet again, I’m still really pleased the non-show characters can finally get stories, and I love the stuff with Retrax (comic relief is perfect for him).